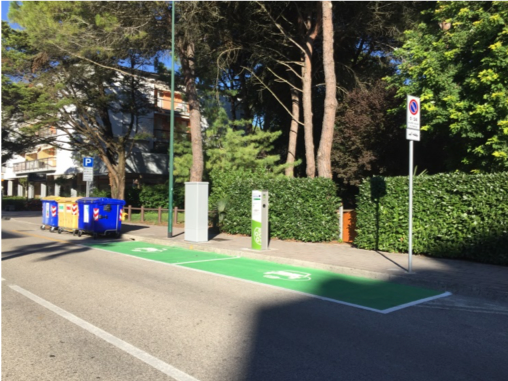 The Municipal Council of the Municipality of Lignano Sabbiadoro approved, at the end of January 2019, the Sustainable Urban Mobility Plan (PUMS), implementing the Urban Traffic Plan (UTP), in force since 2016. This new tool is the result of the MobiTour Project. The SUMP of Lignano Sabbiadoro plans the investments to be carried out in the area. The interventions will be carried out in two phases, 2 years each. The first phase, which coincides with the MobiTour project, foresees the installation of three columns for charging electric vehicles and a series of bike sharing stations with electric bikes. This phase, which can be defined as “experimental”, will allow to evaluate possible integrations, for 2022, to the offer of vehicles and equipment. In the following 2 years the following activities are foreseen according to the PUMS: the installation of a system aimed at counting and classifying vehicle flows, fixed video surveillance cameras on the main roads and informative panels on traffic conditions or other useful communications for citizenship, with real-time updates. Charging stations have been installed and the bike-sharing service will start in summer 2019. Recently, the Municipality of Lignano Sabbiadoro has been included in the 2019 catalog “Cycling Municipalities” of the Italian Federation of the Friends of the Bicycle (FIAB), a national organization promoting the use of bicycle everyday life (for more info: http://www.comuniciclabili.it/).